An impact of ice and rime deposits on the propagation of radar signals along the overhead power transmission lines is studied. The results of long-term multiyear experimental studies are discussed. The dielectric characteristics of ice and rime deposits are described. The effect of wall thickness, density and temperature of ice and rime deposits on attenuation and delay of pulse radar signals are simulated. A method for solving an inverse problem is proposed, according to which the wall thickness and density of ice and rime deposits covering the cables are determined based on the variations in radar signal attenuation and delays. The radar device readings are compared to those of the load sensor when monitoring the formation of ice and rime deposits on an active power transmission line. The developed technique helps determining the optimal regimes of timely melting ice and rime deposits on the cables of overhead power transmission lines to prevent emergency situations. 1This paper is prepared based on the study sponsored by the Ministry of Education and Science of the Russian Federation under Agreement No. 14.574.21.0141 of September 26, 2017; unique project ID RFMEFI57417X0141. Translated from Élektricheskie Stantsii, No. 10, October 2018, pp. 38 – 48. Standard of PJSC “FSK EES” STO 56947007-33.060.40.052–2010. 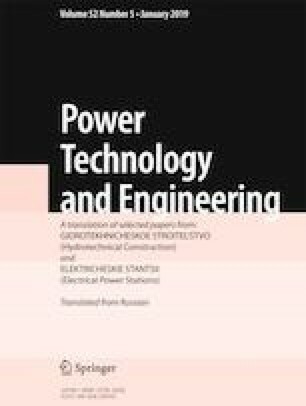 Methodical Recommendations Concerning the Calculation of Parameters and Selection of Schemes of High-Frequency Paths along 35 – 750 kV ac-Power Transmission Lines. http://www.fsk-ees.ru/upload/docs/sto_56947007-33.060.40.052-2010_red.pdf. R. G. Minullin, V. A. Kasimov, and M. R. Yarullin, “Comparison of radar equipment readings and weight sensors indications during ice deposits detection on overhead transmission lines,” in: 2016 2nd Int. Conf. on Industrial Eng., Appl. Manufact. (ICIEAM), IEEE Conf. Publ., pp. 1 – 6 (2016). DOI: https://doi.org/10.1109/ICIEAM.2016.7911426.